Need to unwind and recharge? Looking for some ideas on how to do that? Join us as we discuss 10 ways to unwind and recharge your educator batteries. Chris: Evan & Katelyn Podcast – A podcast about YouTube stuff, making stuff, and life! It will make sense once you start listening… hopefully. New episodes every Monday! Stacey: Essential Oils Solutions with doTERRA—Podcast – The Essential Oil Solutions with doTERRA podcast is focused on providing education about new and fun ways of using essential oils. 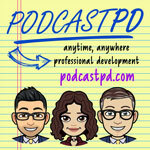 If you want to keep track of what you learned today, or to use this podcast in a class, download the accompanying worksheet by clicking the button below. Our 50th episode is coming and we want you to be a part of the show! If you could only listen to ONE podcast for the rest of your life what is that podcast? What’s it about? Why is this your pick? Congrats to Tracy from Rhode Island who recently won a scholarship to attend ISTE 2019 in Philadelphia! We welcome feedback on our conversations you can comment below or you can contact us here.